Discover how the hidden power of knitting can transform your life. Anybody who has ever held a knitting needle knows the calm and peace it can bring. Few people know how to truly harness this potential to intentionally improve wellbeing. Thanks to the pioneering work of Betsan Corkhill, scientists, clinicians and psychologists around the world are realising and accepting the health benefits of knitting. It has already transformed and even saved lives. Change and challenges are an inevitable feature of life. Modern day stresses are many and varied. To stay healthy everyone needs an accessible tool the can rely on any time, anywhere. Knitting can even be used as an effective tool to manage and improve the symptoms of long term problems. Take a look at the box on the right. ALl these conditions and more have been significantly helped by the simple activity of knitting. ‘Knit for Health & Wellness. 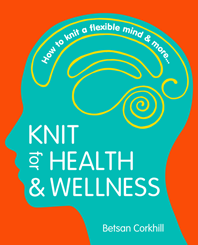 How to knit a flexible mind & more…’ is already transforming the way people think about health, wellness and knitting. Join the growing global community of people learning to live well by choice. Find out more about this groundbreaking book by Betsan Corkhill. Discover the Why. And the How. And if you are interested but don’t really want to buy now, register for a FREE monthly update newsletter here. Pain; Stress; Depression; Anxiety; Fibromyalgia; Panic attacks; ME / chronic fatigue; Hypertension; Agoraphobia; High Blood Pressure; Obsessive Compulsive Disorder; Dyslexia; Bulimia; Low confidence and self esteem; Grief; Arthritis; Carpal Tunnel Syndrome; Boredom; Self Harm; Smoking; Social Phobias; Alcohol abuse; Drug Addiction; Isolation; Muscular Dystrophy; Endometriosis; Irritable Bowel Syndrome; Binge eating; Adenomyosis; Dyspraxia; MS; Sleep Disorders; Cancer; Hand / eye coordination; Chrone’s Disease; Reflex Sympathetic Dystrophy; Abuse; Bipolar Disorder; Loneliness; Parkinson’s Disease; Concentration; Memory; Rheumatism; Weight Loss; SAD; Bereavement; Migraines; ADHD; Fear; Sense of worthlessness; Pregnancy; Post Traumatic Stress Disorder …. ... even Eyebrow plucking and Retired husband syndrome! “Betsan’s book is about ... embracing the complexity of how and why our brain produces experiences. It is about making things, giving things, sharing things, while you make your own journey to recovery. I suspect you will have a rewarding trip."